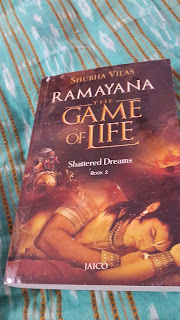 This part of the Ramayana Series covers the story from the decision of Dasaratha to crown Rama as King to Rama's exile to forests with Sita and Lakshmana and the way how different people react to this and cope up with the situations. I felt very happy when I received a review copy from the author as I liked the part 1. Please read my review of part 1 - Rise of Sun Prince here. This Ramayana series explains how the epic story is relevant to contemporary world. I have learnt many facts about Ravana which I didn't knew earlier - his birth, his lust for power, cruelty, his arrogance etc.,We can understand his character well when he threatens Narada muni to teach some mantra and when he enjoys his pride while stepping on navagrahas daily to reach his throne. Every character is introduced to us with lot of details and this gives a new perspective of the story even though we might have known it earlier. There are many wonderful lines in the book mentioned in the footnotes section. I want to note these lines and remember them always. I love this book for the wonderful analogies that author mentions. A teacher is like a tap, and a student is an empty pot. For the pot to fill up, it has to sit below the tap. If the pot sits above the tap, it will remain dry even if the tap is running. Talent without the right attitude is like sweet rice without sugar. Talent brings one to the brink of the bridge to success and right attitude helps one cross it. How long can one go on with smiling faces and crying hearts? Either till the smile of the face goes to the heart or the cry of the heart reaches the face. Life is a combination of hope and despair, the one that dominates you carves your personality. How true all the above lines are..! Overall, this is a book you cannot miss if you like some motivational reads and want to learn something from books.